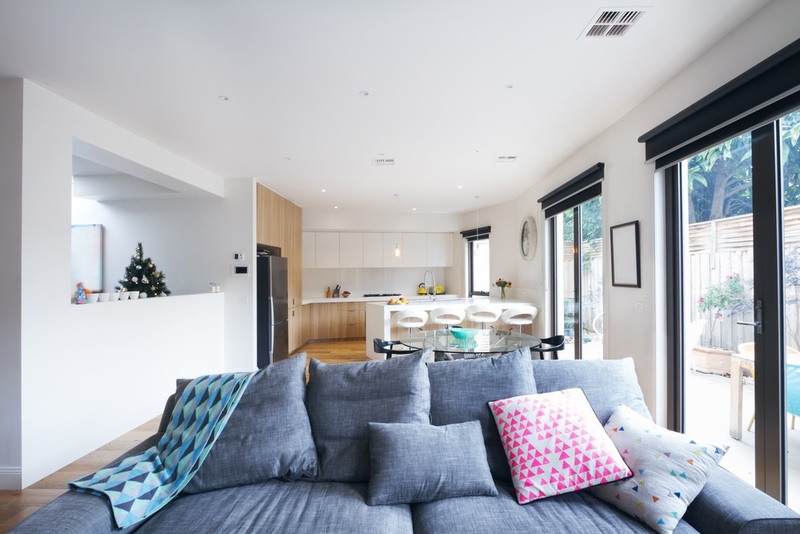 A lot of Aussie homeowners still live in homes with an open-plan format that doesn’t seem right. Their ultimate design dilemma? They live in a house with an awkward flow and interiors that lack focus and cohesion. Designing open-plan living rooms are tricky. There is no formula that works for all, regardless of their room’s shape and size. You need to plan your space well. Decide what features to add or remove. Plot where your furniture will go. Work these things out in the beginning and you’ll avoid an unergonomic home . Leave at least 800mm (2.62ft) of space between two areas. It helps separate the living, dining, and kitchen zones. Lay an oversized rug properly under the living or dining areas. This trick improves the look of each zone. Never station the TV across a window. It will be impossible to watch the TV without blocking the light coming in. Place it on a side where it can dominate, but don’t let it orient the entire area. Create a connection between the areas by repeating design elements. Use lovely patterns, colours, and textures. For a more ergonomic layout, connect the kitchen and dining spaces. If your space permits, consider pushing the dining table against the bench. Station the sink or range on your island so you face towards the living area when using it. This makes your kitchen more sociable. Use plants to decorate the area next to your outdoor space. Greenery will blur the boundaries between your indoor and outdoor spaces. Declutter. Get rid of the things that you don’t need. You can donate your extra stuff to charity. You can also sell the old yet reliable goods you found in a yard sale. Use a long couch with two or more stuffed chairs. Arrange the seats in the living area in an intimate and inviting way. Superdraft tip: The key to achieve a welcoming and cozy space is to negate the tunnel effect and keep the space balanced. There’s no other way but to divide it in half. We recommend that you combine the kitchen and dining in one and the living room on the other. Squeeze in a tiny home office beside the living area if you want. Give equal attention to the living area and the kitchen. Both areas must feel open. A spacious square room can accommodate a wider kitchen bench. Feel free to build yours up to 1000mm (standard is 600mm). While movement in design can excite the interiors, we don’t recommend a lot of it in a square room. You only need a few to keep the interiors interesting. Tame down the repetitive elements, patterns, colours, and shapes. Only level items on different heights when needed. Too much movement in a small and angular room will make the space cramped, busy, loud, and chaotic. Use joinery to establish an area. Apply similar wood components throughout the room to tie all areas together. Use an L-shaped or a modular sofa in the living room. If your space can’t accommodate it, a single couch will do. Planning an L-shaped room is easier compared to the other room shapes as it has defined areas. You can create a seamless kitchen-dining and living-dining room. All you need to do is maintain a gap at least 1000mm (3.28ft) down the thoroughfare that splits the L.
Ensure a smooth indoor-outdoor connection in the section next to the backyard. Place your kitchen on one end of the room so you can open it up and allow the breeze to cool it. Use durable flooring materials. You want a floor that can survive the heat, snow, wet, and dirty foot traffic for a long period of time. Always face your furniture towards a door or window with a beautiful outdoor view. This way, you incorporate your outdoor space and surroundings with the interior design. For better results, engage an architect, building designer — or design professional you need.